Lady Delilah Montebank has decided she's ready to get married. She's spent the last few years matchmaking everyone in her circle of aristocrats, and it's time to prove to herself, and her overbearing mother, that she can make the best match for herself: the most eligible bachelor of all, the Duke of Branville. Except whenever she's in the same room as the Duke, she makes a fool of herself. When her cousin tells her about a love potion, Delilah decides it's so crazy, it might actually work. Until she accidentally gives the potion to Thomas Hobbs, Duke of Huntley. Thomas is one of Delilah's oldest and dearest friend, and has been in love with her for as long as he can remember. So when Delilah's plan goes awry, and Thomas ends up with the potion, he decides it's the perfect opportunity to confess how he really feels. Delilah has no idea how to proceed - does Thomas actually love her, or is the potion really working? And can Thomas convince Delilah she's actually the love of his life before her matchmaking plans take her from him forever? 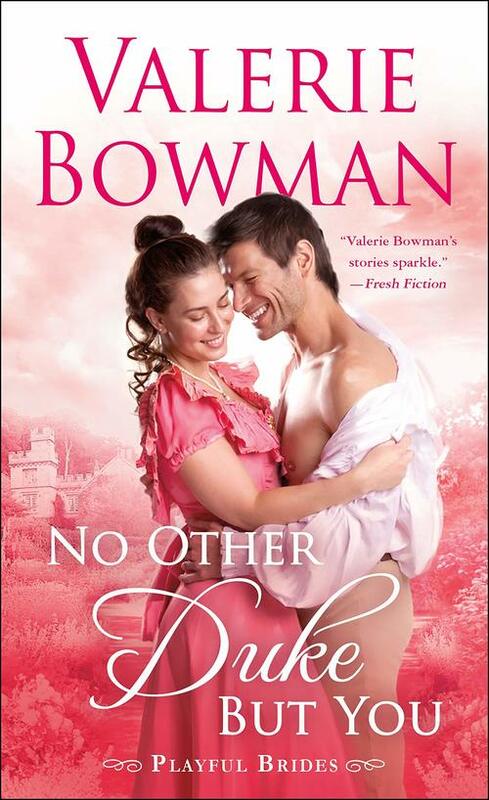 NO OTHER DUKE BUT YOU is the eleventh book in Valerie Bowman's long-running and beloved Playful Brides series. This is an energetic, whimsical, and sweet friends-to-lovers historical romance! The set up with the love potion was a little far-fetched, but it provided an amusing way to get these two characters together. Delilah spends most of the novel concerned over the love lives of her circle of friends, so when she's finally confronted with a real love match with her friend, Thomas, she's unsure of what to do, even though it's blatantly obvious he's perfect for her. Thomas is a patient man, willing to go along with some of Delilah's outlandish ideas, but also knows she's the only woman he wants. There'a large cast of side characters, many of whom are couples from earlier books in the Playful Brides series. I haven't read all of them, and while it was nice to see so many happily married couples, it was hard to keep track of who's who. Delilah's mother was almost comically terrible, but she eventually receives her comeuppance. Recommended to historical romance fans, especially those already familiar with this series.